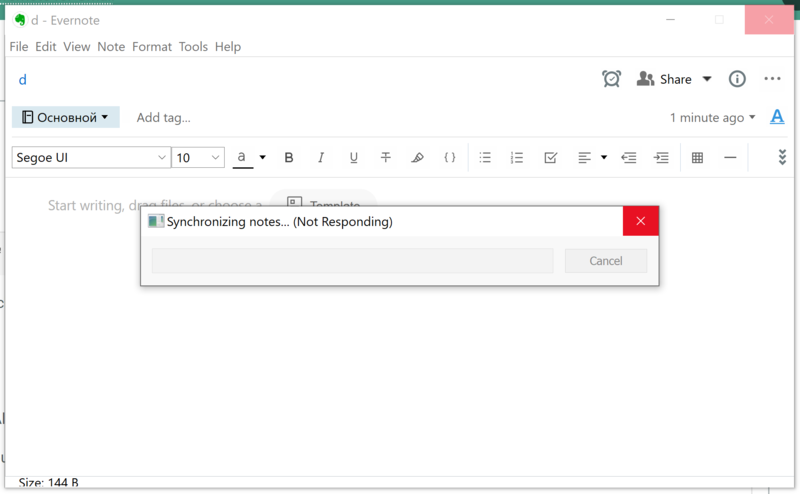 When Evernote is in "offline" mode (both desktop and Android, I have no iOS device to check) then it's not possible to copy a link of a note that has created "offline". Are there any workarounds? Are there are any plans to improve this feature? Sometimes I used to travel by train or by airplane, where an internet connection isn't stable. Also, I often use "Copy Link" feature in order to create links between notes. But this feature isn't working when you are offline. You just see "Synchronizing note..." popup window. Often, it's even hard to cancel this operation - it hangs often (especially on windows) after clicking on the "cancel" button. I just tried putting my phone into airplane mode, and was able to go to the Android Evernote app and copy links to existing notes to the clipboard successfully. However, when I created a new note while in airplane mode, copying the link did not succeed. I didn't get an error message, but no link was copied to the clipboard. I presume this is because the link can only be created after the note has been synced to Evernote's servers, since it is during this process that its unique identifier is created. So I don't think this is likely to be changed. All you could do would be to create the notes while offline, and make yourself a reminder to create the links once you are back online and they have synced. As per @Dave-in-Decatur I suspect the note's GUID is generated at the server. All my new notes go into my @Inbox notebook (collection). >>Are﻿ ther﻿e are any plans to improve this ﻿feature? You might want to post this as a feature request. My Mac experience shows a fix is possible. Even if the GUID is generated at the server it would still be possible to add a workaround for "clients" (by the development team) - they just can "create" a bunch of "hidden" empty notes that are not visible to a user, sync them with the server and pop them while a user is offline (in case it's not possible to shift generating GUIDs from the server to clients). Another workaround just came to me - we can create a bunch of "mock" notes with a specific tag. E.g. "empty_notes" and then use them as needed. Not sure whether it's "fine" to do it manually for the best note-taking app.